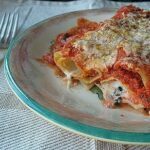 This recipe intrigued me because it used no boil lasagna noodles instead of manicotti shells. 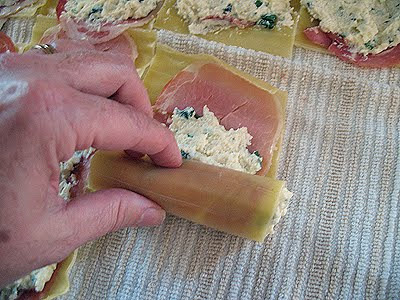 Stuffing manicotti makes for very messy business, so using the no boil lasagna noodles seemed much easier. This is a wonderful dish, perfect for Sunday dinner or get together with friends or family. Admittedly, while I was making the sauce to go with this recipe, I was unimpressed. I worried it wouldn’t be very flavorful, but I was wrong. It was absolutely scoop-up-what’s-left-in-the-dish terrific. I honestly don’t remember where I first saw this recipe, but got the final version from Recipezaar. It originated from America’s Test Kitchen. Because this recipe is a little more involved, I’ve included step by step photos below, the printable recipe is available below also. Don’t worry though, it only LOOKS difficult, but it’s actually really easy to put together and makes for an impressive meal! towels, single layer. 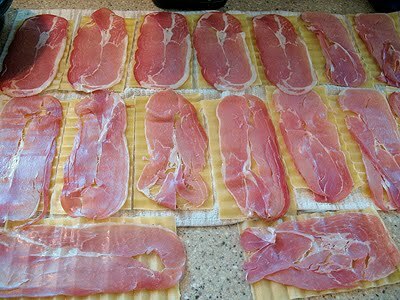 Place a piece of prosciutto on each one. 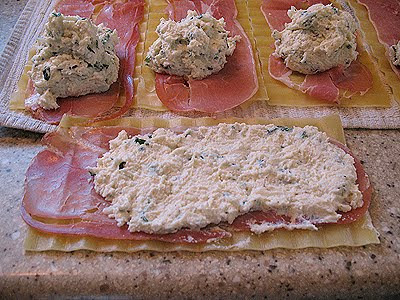 Combine ricotta, 1 cup parmesan, mozzarella, eggs, salt, pepper, and herbs. 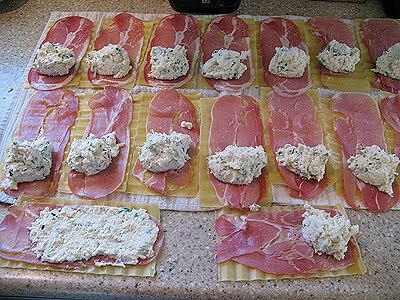 Spread 1/4 cup cheese mixture onto bottom 3/4 of each noodle on top of prosciutto, leaving top 1/4 of noodle uncovered. Starting from the end with cheese, roll into the noodle into a tube shape. 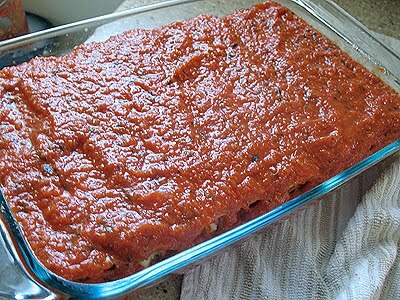 Earlier in the instructions you make the sauce and place about 1 1/2 cups into your baking dish. 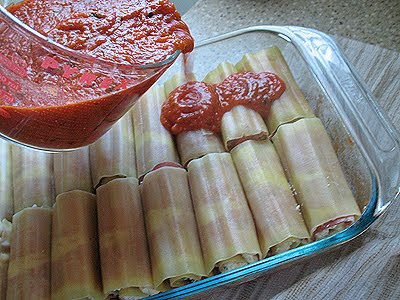 Arrange the rolled manicotti in baking dish seam side down. Top evenly with remaining sauce, covering each noodle completely. Cover the dish with aluminum foil. Bake on the middle rack until the sauce bubbles. 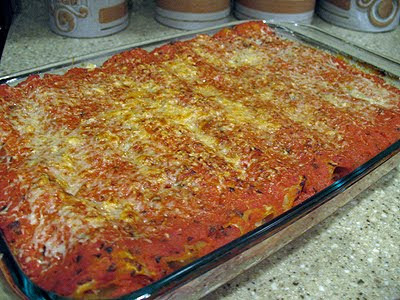 Remove, sprinkle with cheese, adjust oven rack to top, and broil until cheese browns. 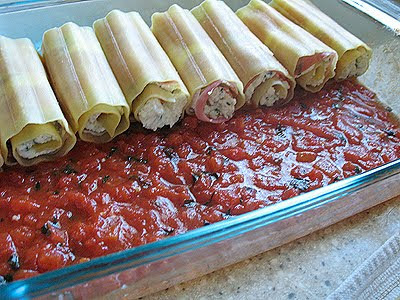 Let the manicotti set about 15-20 minutes before serving. « Thanksgiving Cookies: Turkeys, Leaves and Pumpkins, Oh My! That looks so good Amanda. I just love the step by step photos!! It does look like an impressive dish! I've made lasagna roll-ups before so know this isn't that difficult though I haven't seen the soft no bake kind. What brand did you use? I'm going to keep my eyes open for some. Thanks for sharing the recipe. I'll be giving it a try. This looks great. 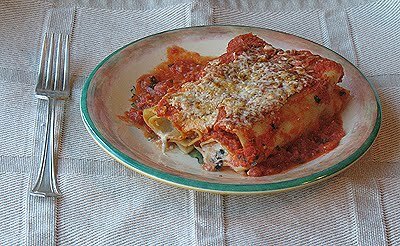 I love baked pastas like lasagnas, stuffed shells and manicotti's. So hearty and comforting. That looks delicious! Perfect to make on a Sunday and enjoy leftovers later in the week. I just showed this to my husband and he's drooling over it. :) This is DEFINITELY on our "must make" list. Thanks, Amanda!! Such a simple and meticulous way of doing it! 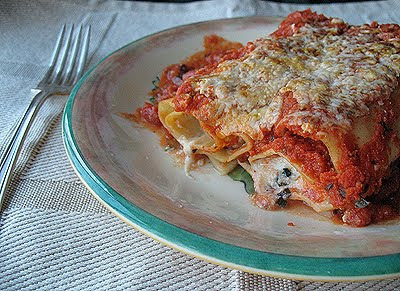 Though I wonder if I can do something as simple as this with dried store bought manicotti? Love the technique. I can never stuff manicotti shells without tearing them. I really like the idea of these roll-ups. I don't think I'd want to take the time to stuff manicotti shells, either. Sounds like a delicious filling, too! That's so nice of you Peter, thank you! Coming from you that's a great compliment :) And thanks for the RT as well! Amanda, your organization makes this dish very easy to reproduce. I would be glowing if I made this. Absolutely! The meat is very thin and just for additional flavor. Would love to hear/see how it turns out for you! 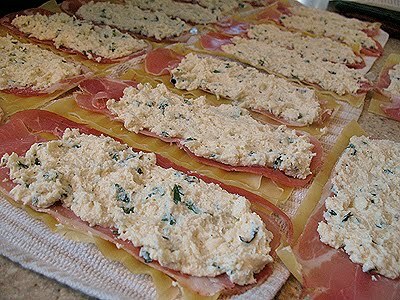 I would love to make this with only the cheese and maybe add some spinach to the filling. Can't have the meat. Would it hold together without the meat?